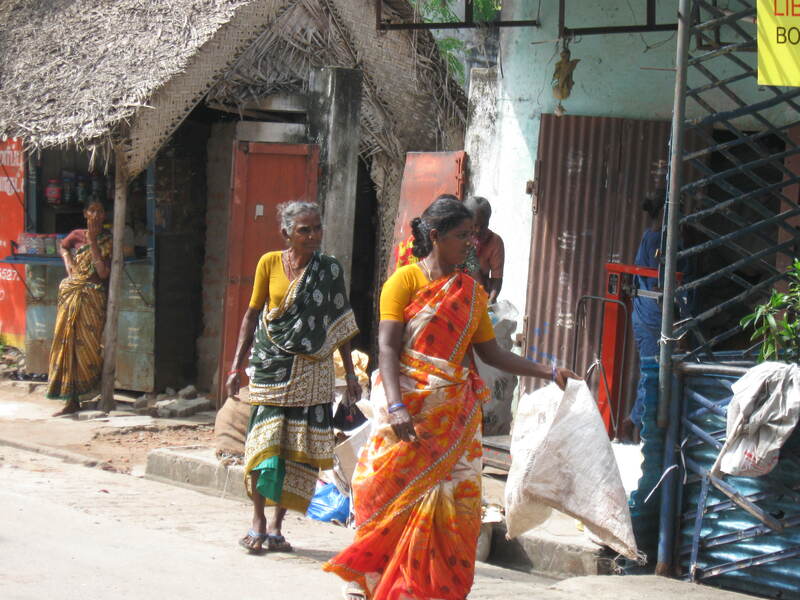 I took this – admittedly, intrusive – photograph of neighborhood women who had just filled their bags with rice and were about to put them on their head and walk home. When they came over and asked me for money, I was nonplussed, but since then I have started to adopt Elizabeth’s strategy: keep track of how much I’d give, how many times I’d give it. Find a good local NGO (there are several in Pondy), and send the money there. We spent one morning at the Auroville Paper Factory, where Elizabeth was in heaven,coming away with several possibilities for her work with ThingsAsian. She is nearly finished with a book on Asian hand papermaking, so to say she was impressed by what they do there and how beautifully they do it, says a lot about the place. We saw the marbled paper in the photo below being made! I’ve made a fair amount of paper and have dreamt of being able to do this marbleing technique, so was hypnotized watching the men spill/drop oil paint into washtub-looking containers then fanning the vats until they were satisfied with their design. They lay the paper over the liquid, do some sort of incantation [I’m making this part up], then peel away the paper, revealing those gorgeous effects that bookbinders as well as stationers and letter-writers love. As for Auroville itself, and The Mother, and the Matrimandir (a golden dome/ meditation hall) said to house the largest (70cm diameter) solid crystal in the world — I have a few reservations. Images of The Mother are everywhere in Pondicherry: one was at our guest house, several were around the various buildings comprising the paper factory, and dozens more were in Pondy restaurants. To me, the ubiquity of her image suggests that this French woman/artist-turned-guru (d. 1970’s) founded a haven for New Age expats…2/3’s of the 1800 members of the ashram are Western. On the other hand, they do some good, “green” work, and at our guesthouse one of the ashram members gave incredible Ayurvedic massages – so, my reservations may partly be sour grapes: for 8 months I tried to get reservations at one of the guest houses out in Auroville and was turned down each time I wrote! We did learn this, from others staying at our guesthouse in Pondy: you have a better chance of getting in if you just appear at the Visitors’ Center in Auroville. 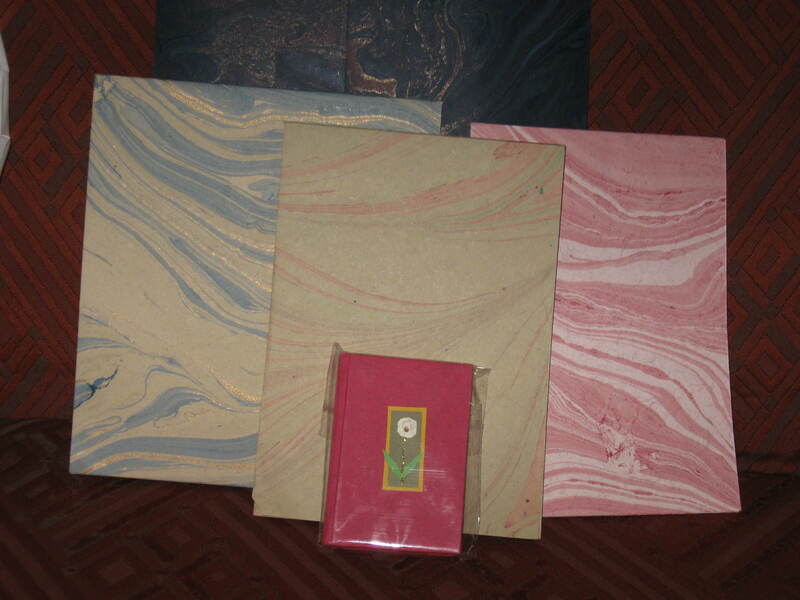 Marbled Paper, Auroville Paper Factory: I rambled on about Auroville, above, but have no photos, either from there or from the paper factory: none from Auroville b/c it was just too, too odd an experience. Also, I was busy, ahem, shopping, or anyhow browsing, wasn't I? The boutiques in Auroville have beautiful silks ( salwar kameez, dupattas, saris, even silk picture frames and jewelry), magnificent incense, and great quality ceramics! We had nearly a week here in Pondicherry. A Note: I’d suggest “SlideShow” because it’s prettier; just 1 caveat: it’s also fast, possibly too fast to read the longer-winded captions. I was about to leave the Internet shop, when I noticed I wasn’t wearing shoes! I will manage, even if I go outside and find my shoes (Croc fliip-flops) are gone! But they won’t be. However, one thing I can’t leave w/o doing is this: I re-read the initial posting and realized I’d somehow left the cursor in odd places, and so mis-editing made much of that earlier post unreadable. SO – if you are a subscriber, instead of reading the post which comes to you via email, which is pretty much gibberish, you need to go to the actual blog: mebtravelling.com. I could have copied/pasted, but this Samsung syncMaster 753s doesn’t like me, and so would undoubtedly scramble everything even more. If only in babysteps, and only tentatively, I can see some movement towards acclimation to India. This morning, for example, I didn’t think twice – or once, even – about going barefoot out to the garden for breakfast. We leave our sandals at the guestroom entrance, but I’ve always been painfully aware of the millions of footsteps that have gone before mine, and I don’t mean that in a nostalgic or pleasant sense. But today, I was well into my second cup of Nescafe, pleased that I knew how to order that second cup, before I looked down and thought about my bare feet. An Aside: To order a second cup of coffee, I have learned to catch the eye of the lovely, sari-clad servant — not difficult, as she stands roughly 5 feet away watching me eat. Then I point down at the 1st cup and say, “Same-same” or sometimes this variation, “Same? Same? ” Eventually, she moves just her head; it goes left, then right Think “bobblehead” — and I don’t mean that disrespectfully, but simply as a way to describe an Indian gesture that defies [my] experience . In this instance, the head movement means, “Gotit. You want another one of those.” And about 3 minutes later I have a just-boiled cup of Nescafe. The first couple days, she and I would go through a similar ritual about milk, but lately, I’ve begun to give up, which quite honestly seems to be simpler for both of us. Then again, I thought, this morning, really, I am NOT at the ashram yet, am I? Subsequently, I flipped a switch near a small tank affixed to the wall, a tank I really hoped was a water heater, in an area of the bathroom that serves as the shower: no door, no curtain, but home to a large dark drain with creatures who skitter into it whenever I turn on the water. ( Rule #1: If it moves away from you, don’t worry about it). Day 1: Sure, I can get you a cell phone,no problem. Day 1.5: You want a Smartphone? No? OK, very basic, I can get you very basic phone. Day 2: I need your passport photo. No passport photo? We can use your daughter’s extra passport photo,then. Day 3: Your daughter’s passport address must match the address on her visa. It does not. Send out one of the servants to get a pencil [check]. Now, I will take out my knife and sharpen the pencil [check]. Your daughter is resting? YOU MUST WAKE HER UP! You will sign in these two places for her, matching her signature [broad smile]? OK. This paperwork is important, you understand for terrorist security reasons. Day 3.5: You are sure Basic Phone is OK? For more Rupees, I could…No? OK [by implication, “It’s *your* funeral, Ma’am.”]. Day 4: [Elizabeth has asked for the paperwork/the Guarantee, in case something goes wrong with her-my phone] Oh, no paperwork, no-no. I got this phone from my friend’s shop; my friend does not do paperwork. You want paperwork [Elizabeth says, “Yes” and stares at him]. That will cost more Rupees [E. does that beatific smile]. Well, ok, I will try. As I say, I now have an Indian cell phone. I see that there are already twopre-programmed numbers: I can dial in for Cricket Updates and I can dial my Daily Astrologer. Atul’s friend must have interesting customers. When I could leap out of the autorickshaw, through the police barriers, past the beggars (don’t ask), my kameez billowing in this morning’s breeze, as I headed for my goal, I knew I’d made another breakthrough. I decided this morning that I would go visit Ganeesh, the Elephant God, or anyhow the incarnation of a god; he stands – looms, really – in his temple’s courtyard. I’d read essays about him, and the section in Elizabeth Gilbert’s book; I’d seen photographs, and of course watched Julia Roberts’ visit in “Eat, Pray, Love”. More recently, I heard him bellowing next door to our Pondicherry guest house. At first I thought it was one of the cows I stumble on and over everytime I step outside, but as it went on, rising like a trumpet trying for the right noteand just missing it, I knew it was Ganeesh. 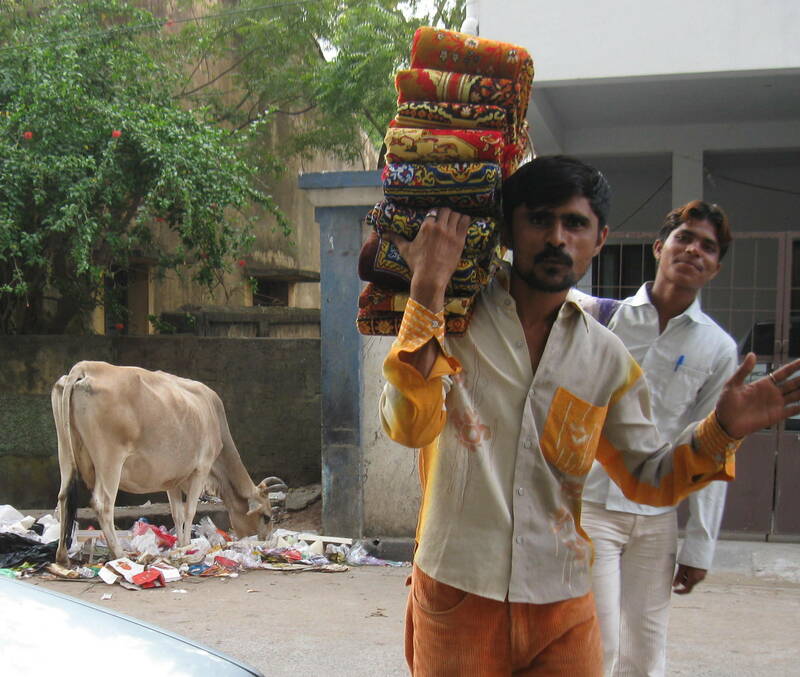 Anyhow, there I was, a .5 km ride away from where we are staying, standing in the courtyard of the temple of Ganeesh. He slowly lurched, not his body but just his colossal head, back and forth, waiting there very patiently, surrounded by children and camera-snapping parents. It was fun, almost hypnotic, but also a little sad. I think the only break the poor animal gets is for lunch, then he is back at it until dark. You put money or food near his trunk, he takes it, swings what you’ve given him towards his keeper, who makes a deft grab, then comes back and pats you on the head with the end of his trunk. Of course, if he is an incarnation of Shiva, maybe he doesn’t feel the fatigue? Or maybe he offers it up (no, wrong image, too Christian)? Or maybe he just takes deep breaths all day, and the bellowing is actually his mantra. In the end, I just couldn’t do it, though; maybe another time. I took some photos, and I’ll walk back there before catching an autorickshaw to the guesthouse, but no pat on the head from Ganeesh today.